There are a number of good arguments for choosing an infrared heater, and a major one is that it is less costly than conventional heating methods. This is mainly because an infrared heater uses less energy than a conventional heater. This type of heater radiates infrared rays that are absorbed by the various objects in the room raising the temperature of the objects. As cooler surfaces gently warm up, the overall ambient temperature of the room is also raised. On the other hand, conventional heaters work by warming up the air in the room. But warmer air rises to the ceiling at a faster rate than the cooling down rate of infrared warmed up objects. Therefore, to keep the room comfortably warm, a conventional heater would have to work harder than an infrared heater, using more energy and costing you more. By heating the objects in the room and not the air, infrared heaters provide maximum warmth and energy efficiency. So, you will not feel cold when you get away from the heater, and you will not have cold pockets of air in different spots of the room. Anywhere in the space you are heating, you will feel pleasantly and comfortably warm. The best part is that there is no noisy blowing of hot air from the heating unit, and the temperature increase happens in a quiet, safe and pollution free environment. Infrared heaters do not lower the oxygen levels in the room like gas or other electric heaters can. Also note that, because of their simple design, infrared heaters don't weigh much, often have caster wheels, and are easily portable to where you need it most. Some of the features you should be looking for in an infrared heater are quartz bulb(s), cool-touch exterior, thermostat, simple controls, adequate heating capacity, quiet fan, caster wheels for easy portability, and attractive design. 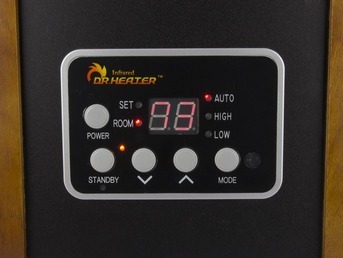 Many have been wondering about the exact dollar savings one can realize using infrared heaters. Some manufacturers claim that using their infrared heaters instead of your regular heating system, you could save up to 50% on your electricity bill. Statements such as these need to be qualified as each home has different heating requirements, and the way people use the infrared heaters in conjunction with their home's central heating system comes also into consideration. In general, infrared heaters are amazing for cold snaps and to heat up cold spots and colder rooms in our homes. But unless you have a small home under 1000 sq-ft, they are not intended to replace your whole home central heating system. They are mostly for supplemental heating needs. However, because of how infrared heating works, you should definitely see some reduction in your overall electricity use, if you are using an infrared heater to warm a room while turning down (but not turning off) your more costly home central heating system. This review will compare the Dr Infrared DR968, iLIVING ILG-918 and Duraflame 9HM9126-O142 portable infrared heaters. These heaters were top sellers in the portable infrared heater category among Amazon buyers at the time this review was written. All three had received an average rating of 4 stars (out of 5 stars) from Amazon customer reviews. The excellent value they offer at their relatively low price may explain in part their popularity. Selected Portable Infrared Heaters on Amazon. Important Note: Dr Infrared DR968 and iLIVING ILG-918 heaters are essentially the same product marketed under two different brand names. Therefore, in the rest of this article we will only refer to the Dr Infrared DR968 heater, with the knowledge that everything we say about this heater (except for the price and warranty) applies also to the iLIVING ILG-918 heater. Note 1: Dr Infrared DR968 uses a dual heating system with both quartz and PTC (Positive Temperature Coefficient) heating elements. 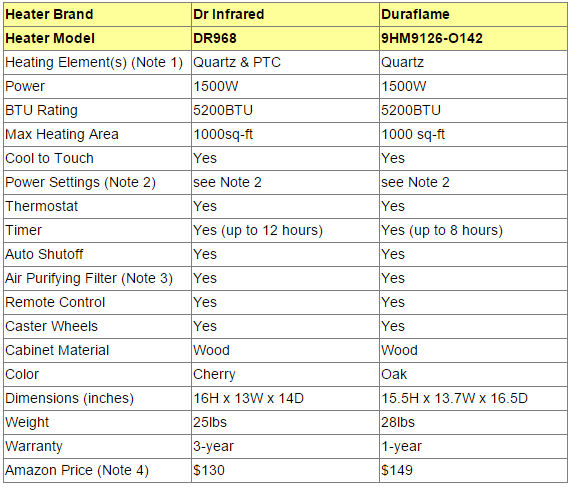 Duraflame 9HM9126-O142 uses only quartz elements (6 of them). Note 2: Dr Infrared has three power settings: Auto, Low (1000W) and High (1500W). When Auto is selected, you can set the desired temperature to between 50-86F, and the thermostat will make sure that the desired temperature is reached and maintained. You can also manually set the heater to run on High or Low all the time or with the timer. An auto shut off feature prevents overheating. Duraflame 9HM9126-O142 has also a thermostat that can be set to the desired temperature. The thermostat will make sure that the desired temperature is reached and maintained. The heater also includes the SaferPlug technology which monitors the temperature in the plug and will turn off the heater to prevent unsafe conditions. Note 3: The air purifying filter of both heaters can be cleaned and do not need to be replaced. Note 4: The prices shown are Amazon prices in effect at the time this article was written and may have changed. For exact price information, please click the product image links in the Amazon section below. Note also that the Amazon price often includes a good discount on the list price. If a discount exists, both the list price and the Amazon price will be shown when you click the product image links in the Amazon section below. Note that both heaters have very low noise levels. This electric infrared heater is housed in an attractive cherry color wood cabinet that will integrate well into any decor. It is not just lightweight (25lbs), but it is also equipped with four caster wheels, so it can easily be moved around from one room to another as needed. It has a simple to use LED control panel (shown in the picture). Equipped with a dual heating system (quartz and PTC heating elements) and high a velocity low noise blower, it increases the heat distribution and transfer rate, and the result is heating your room to a comfortable temperature in a very short time. It features an electronic thermostat that is used in conjunction with three power settings: Auto, High (1500W) and Low (1000W). When Auto is selected, you can set the desired temperature to between 50-86F, and the thermostat selects smartly between the Low and High settings until the desired temperature is reached. The thermostat regulates then the heater and causes it to cycle on and off to maintain the set temperature. You can also manually set the heater to run on High or Low all the time or with the timer. An auto shut off feature prevents overheating. This heater is perfect for warming quietly indoor spaces up to 1,000 square feet. It's noise level is a very low at 39 dB. It includes a 72 inch electric cord, which allows you a wide range of placement options and a remote control. To maintain this unit, you just need to clean periodically the air filter with warm water or a hand-vacuum. The lifetime of the infrared heating elements is over 20k hours. Note that the Dr. Infrared Heater is perfectly safe around children and pets and it only gets slightly warm to the touch. It does not have any exposed heating elements that could be a fire hazard. The unit comes with a 3-year manufacturer's warranty. This electric infrared heater is housed in an attractive oak colored cabinet made of hardwood and wood veneers that integrates well into any décor. It has traditional design features with beveled edges and decorative inlays that add to its polished look. It is lightweight and equipped with concealed caster wheels that can roll in any direction. The six quartz heating elements of this unit can deliver quiet and pollution free supplemental heat to up to 1,000 square feet of space. It is also equipped with a filter which does not need to be replaced. It just needs to be cleaned periodically which can be done easily using hand-vacuum or warm water. The 1500W unit is equipped with a precise digital thermostat that can be set to the desired temperature. The unit automatically turns off when the desired temperature is reached. The heater also includes the SaferPlug technology which monitors the temperature in the plug and will turn off the heater to prevent unsafe conditions. Finally, this heater has a simple to use control panel (shown in the picture) with LED display and comes with a remote control. It is built for safety around children and pets as heater is 100% safe to the touch. The unit comes with a 1-year manufacturer's warranty. So, which infrared heater is better to buy? When you compare portable infrared heaters and take into consideration heating power, product features, quality and durability, you find that both products described and compared above can be safely considered as excellent value for the money, and you would probably be quite satisfied with either one. 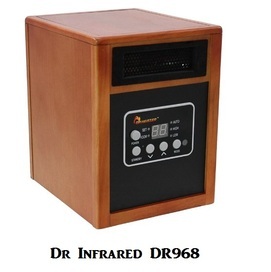 The main advantages of Dr Infrared DR968 is that it comes with a longer warranty, and it is equipped with a couple of additional power setting options (Low and High). As mentioned, this was the top selling infrared unit among Amazon customers at the time this article was written. Thousands of satisfied customers have even purchased more than one unit, and many have referred the DR968 to their friends and families. Please click the infrared heater of your choice below for price information or to purchase. Would you rather have an Infrared Quartz Rolling Mantel Fireplace? For those looking for a rolling mantel infrared quartz fireplace that offers you the luxury of easily moving the fireplace mantel from room to room, we recommend the ClassicFlame Duraflame 23IRM1500-O107 fireplace, which at the time of this writing was the most popular and best rated in its category among Amazon customers. Heating your entire home all day may not be the best economic choice for your utility bills, particularly with the rooms which are used only during certain parts of the day, like bedrooms, dens and basements. Zone heating is an effective and economic way to provide comfort to your home, without having to warm every room. You can shut off the heated air blown to different sections (or 'zones') of your home which aren’t occupied and use a portable heater like the ClassicFlame - Duraflame 23IRM1500-O107 to provide supplemental zone heating for the part of your home which is occupied. The 23" infrared quartz fireplace with a 5,200 BTU heater provides supplemental zone heating for up to 1,000 square feet. Offers 125 selectable flame effect options to create the perfect mood and ambiance for any style. Furniture quality locking casters roll in any direction for convenient mobility. ​The digital display thermostat and remote control provide added convenience and makes the unit easy to control. The rolling mantel with electric infrared quartz fireplace ships assembled so it is ready to provide warmth right out of the box.